"This is a delicious, hearty, heart-friendly vegetarian stew. I serve it with polenta, but it would be equally yummy ladled over mashed potatoes, sweet mashed potatoes or rice. Garnish with fresh herbs." Place dried mushrooms in a small bowl with enough hot water to cover; let stand 20 minutes. Drain mushrooms; reserve liquid. Heat oil in a large pot over medium high heat and cook and stir onion until soft, about 5 minutes. Reduce heat to medium; stir in garlic, thyme, and cloves and cook and stir 2 minutes more. Stir fresh mushrooms and soaked dried mushrooms into onion mixture; cook and stir until mushrooms are soft, about 10 minutes. Season with salt and pepper. 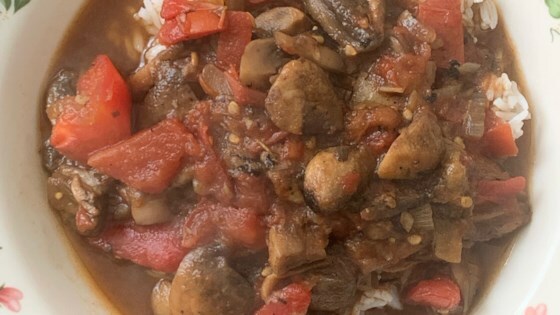 Stir tomatoes and reserved mushroom liquid into mushroom mixture; simmer over low heat until thickened, about 20 minutes. Bring vegetable stock to a boil; whisk in polenta. Cook polenta, whisking constantly, until polenta is thick and stock is absorbed, about 5 minutes. Divide polenta into 4 bowls; ladle mushroom stew over polenta and garnish with fresh parsley. You can stir a small handful of fresh herbs into the polenta after cooking, if desired. Nice vegetarian stew perfect for lent or meatless Mondays. Will make again.